I can’t remember when I’ve last made one of these posts, but it was years ago. While this blog has obviously drifted far from its roots as a zombie blog with miniature gaming elements, I haven’t lost my interest in the genre. In the last few days I’ve come across two zombie movies that seem interesting and different enough to warrant sharing. At an army base in rural England, this group of unique children are being studied, subjected to cruel experiments by biologist Dr. Caldwell. Despite having been infected with the zombie pathogen that has decimated the world, these children retain normal thoughts and emotions. And while still being subject to the craving for human flesh that marks the disease, these second-generation “hungries” are able to think and feel, making them a vital resource in the search for a cure. In general I’m not too partial to the idea of thinking zombies, but I do like the concept of this one. It also seems to be a refreshing take on the genre, even if we’ve seen the “this child is the key to the cure” storyline many, many times. It might be Britain as a backdrop, but this one also reminded me of 28 Days Later. That’s always a good thing. The movie is coming to UK theatres on September 23. I have a soft spot for adult animation (oh, that sounded wrong…) so an animated zombie movie with a Romero-ish political take sounds like a treat. This South-Korean film is apparently doing the festival rounds at the moment. Now, the zombie genre experienced a massive growth in popularity in the early 2000s. While it has been on the decline – or rather become a staple of pop culture – every now and then something really interesting pops up. As you may or may not know, this blog used to focus a lot more on zombies when I started out in 2009, but the focus has shifted almost exclusively to miniatures. I’m a big zombie fan, but I must admit even my interest has wavered with the over-saturation of the zombie market. This means my interest is nowadays not easily piqued when it comes to zombies. It’s the trailer for the new Fear the Walking Dead series. It’s a prequel and a “sister story” to the main series. Apparently it details what is to me the most exciting piece of any zombie story: the rise of the epidemic and the collapse of society. Interestingly, and probably because of budget constraints as well, few movies ever show this. Night of the Living Dead stops before it happens. In Day of the Dead, 28 Days Later and many others it has already happened. I’ve always been fascinated (in a very sane, rational and normal sense) by catastrophes, what-if fantasies, tales of desperate struggle and the end of the world. The sinking of Titanic, alternative history, Helm’s deep, Alamo, Chernobyl, The Book of Revelation, global epidemics, thermonuclear war…you name it. The zombie genre combines all of this. Simple as that. This is exactly what Fear the Walking Dead appears to showcase. No wonder I’m pretty hyped. Fear the Walking Dead launches August 23 on AMC with a 1½ hour special episode. The new Godzilla film has been my most anticipated movie since Fellowship of the Ring, so you can imagine that I had pretty big expectations when I walked into the cinema. I was also excited and a little bit fearful – after all with high expectations comes a high risk of disappointment. Happily enough, I wasn’t let down by the film. I saw the 2D version. I will try to keep this film fairly spoiler free, but if you are such a purist that you haven’t even watched any trailers, I suggest you stop reading here. The basic premise of the movie is simple enough. There are giant monsters, they fight each other and mankind gets caught in the middle. However, I like how they’ve managed to keep the film feeling fresh and interesting instead of simply having a two hour CGI slugfest. Luckily, that’s not to say there isn’t a good bit of monster punch-out involved. Let’s start with the best parts. First of all, the visuals. Godzilla looks very, very nice. The shots of Godzilla and the other monsters wrecking civilization (and there are plenty of those) are excellent. There’s a great sense of scale, and a feeling of weight often missing from CGI. The monsters feel big, heavy and physical as does the destruction they cause. There are some actually beautiful shots in the film, balancing serenity with destruction – an aerial shot of a Navy fleet following Godzilla was a particular favourite, as was Godzilla looming over the lanterns of San Francisco’s Chinatown. There’s plenty of colour and variety of locations in the film, from the islands of the Pacific to the deserts of Nevada. The sound design was great as well, supporting the visuals. Again, the roars and screeches of the monsters are impressively loud and animalistic, and the theatre rumbled with the roars and the destruction. There is often a nice contrast in the film with calm moments in the audiovisual storm, before the movie again erupts into full-on chaos. My absolute favourite is a sound used a few times in the film, where the destruction of a tower building’s windows creates an ethereal, hauntingly beautiful tinkling. If you’ve seen Gareth Edwards’ previous film Monsters (and you should), there’s a lot of similarity in feel here. The real beef of the film is of course the combination of monsters and destruction. After all, when you’re going to see Godzilla, you’re going to see a film with monsters destroying stuff. The movie does not disappoint. There is plenty of both available and with loads of variety. You will see the monsters fighting ships, planes, tanks, helicopters and infantry and destroying power plants, trains, skyscrapers and landmarks. There’s even a tsunami thrown in. Godzilla looks a lot like a catastrophe movie, as it should. The monster designs are very nice and things are kept interesting. I want to dedicate a paragraph to the monsters themselves. Monster choreography in Godzilla is excellent. The battles between monsters look like something out of an awesome David Attenborough -narrated nature document. The monsters look, feel and act real, and mostly they don’t feel like movie heroes and villains, but simply giant, monstrous animals, which helps sell them to the audience. I also liked the fact that despite modern day visuals, they haven’t completely done away with the “man in a suit” feel of Godzilla. As you might guess, the plot and the human characters don’t particularly shine in the film. Both are adequate for the film, and the plot has a few interesting twists, but let’s face it: in a genre film like this, I’m not going in to see awesome drama, deep characters and an intricate plot. If anything, the film tried to inject too much character and family drama into the film, but it didn’t really work. While it didn’t really fall flat on its face, the end result was still a little meh and felt unnecessary. The same thing plagues pretty much every big apocalyptic film (with the exception of Pacific Rim): the destruction of millions of people is not seen as tragic enough, but there always has to be the story of a family separated by the events. In Godzilla it isn’t as cheesy as several other films (say the god-awful 2012), but the plot device didn’t really work. All the actors turn in a solid day’s work, but there really isn’t anything remarkable on offer. There are a few minor irritations, my personal not-favourite being Ken Watanabe’s Japanese doctor, who should be an expert on the subject but tends to only offer cryptic and dramatic lines in a gruff voice instead of being of any help. There was an element of environmentalism in the movie, which didn’t feel too forced, nor was it really heavy handed. After all, the Godzilla franchise has always been about radiation and its dangers, so this was perfectly in line with the previous films. In a great avoidance of plausible explanations (which never work in movies like this) it’s simply stated that the monsters thrive and feed on radiation. That’s cool with me. In a genre movie like this, there’s often a tendency to go with a mass of obvious irritating tropes. Director Gareth Edwards and writer Max Borenstein are obviously quite familiar with these, as the movie often sets up situations like this, and then resolves them in a smart manner. An example is a scene where Godzilla is at Golden Gate bridge, and a courageous bus driver with a bus full of children decides to make a run for it through barricades, tanks and all. As the scene unfolded, I was rolling my eyes, as I knew exactly how it would turn out. Despite the chaotic situation, the heroism of the driver would of course clear all the obstacles previously established, there would probably be a groovy one-liner (“Hold on kids, this is gonna get bumpy!” or something similar) and then off they go. I won’t spoil it for you, but things took a more realistic turn. Things like this had me liking the film a lot. Other favourites included an intelligent, sensible military and its non-crazy, non-murderous commander – both aspects always missing from films like this. Overall verdict: Godzilla is a nice catastrophe movie, and an awesome giant monster movie. It avoids most pitfalls of the genre and offers a wonderful audiovisual experience. If you go in expecting plenty of character development and an intricate plot, you’ll be sorely disappointed – then again, if that’s what you’re looking for, why on earth would you go see Godzilla? If – like me – you go in expecting to see cities levelled and monsters brawling against each other and the military, you’re in for a treat. Godzilla takes second place in my giant monster top 3, behind Pacific Rim but ahead of Cloverfield. The film picks up years after E Day, the worldwide attack of massive insect like beasts, as the remaining humans from all walks of life must band together to survive and fight back against the monstrous invaders. Viewers are introduced to Ellen (Ceren Lee), a mother who has lost her child, and watch as she prepares to play a major role in the human resistance. The cast also includes Steve Braun (Wrong Turn 2), and Erica Gimpel (Veronica Mars). The hit graphic novella series Enormous, tells of how humanity is plunged down the food chain when an ecological event creates gargantuan beasts that decimate civilization. The series explores how humans react and cope with survival from multiple points of views and from multiple settings around the planet. In the tone of Cloverfield and The Walking Dead, Enormous focuses on strong characters and complicated relationships with the monsters as the background. Sounds pretty groovy to me. It’s a web series, and premieres on March 20th. Oh, you ‘ve probably never heard of Godzilla. Apparently it’s some kind of a monster movie. An ancient colossal creature is accidentally awakened by mankind, and seemingly leaves nothing but destruction in its wake, as its presence becomes known to the world. Official site can be found here. The movie premieres in the US on May 16th. Really looking forward to both of these! 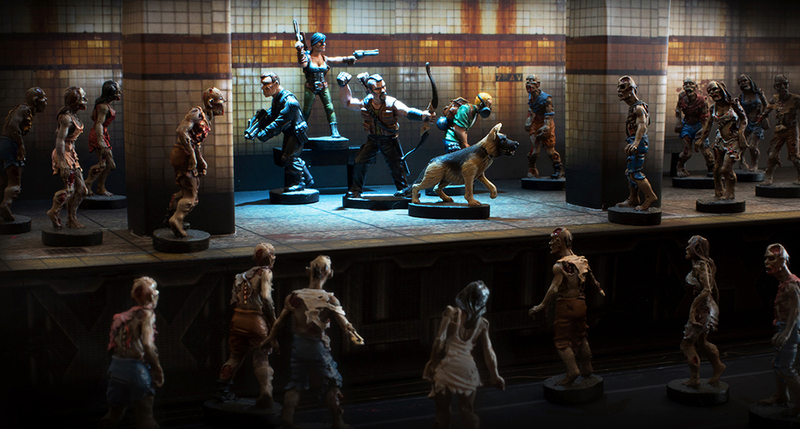 Z War One is a miniatures-based survival horror board game. It blends tactical sci-fi shooting with classic RPG elements in an interactive comic book format. Players take control of one of the game’s 4 main protagonists for the duration of a 6 chapter issue, completing missions to gain experience points which they may then either save, or spend developing their character. The player with the highest number of experience points at the end of the last chapter is the issue winner. Gameplay swings between co-operative and competitive as players work together to overcome insurmountable odds only to betray their teammates at the final hour in a bid for personal glory. The boxed game contains issue one, with each subsequent comic book acting as an expansion pack, continuing the story and introducing new monsters, heroes & environments. Sounds delicious! Anyway, while the video doesn’t bring much new to the table, it’s a nice piece of low budget zombie film. It makes you wonder why game companies don’t use more live action films to promote their product, as for me this worked a treat. It made me not only check out their site, but make a blog post about it as well. After seeing that, you might as well go see their official site. There’s apparently a Kickstarter on the way. I’m a sucker for infection movies, as well as short and sweet pieces that manage to tell a story. With that in mind, Journal of an epidemic_ by Australian film maker Olivier Mamet hits a sweet spot with me. As the title suggests, it tells the story of a global apocalyptic infection. In three and a half minutes humanity crumbles to nothing and we’re treated to the last of our kind. The film itself is like an intro to an apocalypse flick, which is both a strength and a weakness. On one hand it draws you in, on the other it stops just as it’s getting most interesting and would probably have benefited from a few more minutes of storytelling. Most of the short film is made of archive footage. It’s spliced together nicely, and I like the way the story is told. We have the usual hospital shots and newsreels as well as the near-obligatory microscope shots. In addition to the archive footage, there are some lovely shots of empty cityscapes. Judging by the lighting and the lack of people I assume these have been filmed during the early hours of the day. It’s nothing new – 28 Days Later‘s abandoned London pretty much set the standard – but the shots are beautiful in themselves. The third element is filmed footage of a gasmasked survivor going through the remains of civilization. There’s a voiceover narration throughout the film, and a special mention must be made of it. The narrator Luke Atencio has a very pleasant voice, which is critical in a short movie like this. No, seriously. Having to listen to an annoying voiceover for the duration of an entire film? Think about it. It’s not coincidental that they cast the likes of Sir Ian Mckellen or Sigourney Weaver as narrators in films and documentaries. Overall verdict: Journal of an epidemic_ is a nice and sleek little short film. While it’s not revolutionary, it manages to condense an end of the world story into a little over three minutes, which is nothing to be scoffed at. Go ahead, watch it. There are far worse ways to spend three minutes. For more information see the official Fist of Jesus homepage, as they’re looking to turn this gem into a feature film!